With his latest release, ‘ Jolly LLB 2 ’, heartthrob Akshay Kumar has added another feather to his cap. The actor has not just entered the 100-crore club for the seventh time but has also equalled Shah Rukh Khan ’s action drama film ‘Raees’ in respect of making Rs 100 crore business. This is Khiladi Kumar’s fourth consecutive film to enter in the Rs 100 crore club. Before ‘ Jolly LLB 2 ’ Akshay Kumar ’s ‘Airlift’, ‘Housefull 3’ and ‘Rustom’ has successfully reached the Rs 100 crore mark. 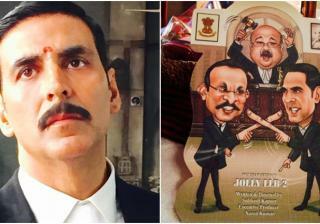 Interestingly, ‘ Jolly LLB 2 ’ which is a sequel to 2013 courtroom comedy drama, ‘Jolly LLB’, has earned around Rs 50.46 crore in its opening weekend said the producer of the film. The movie is riding on fantastic word of mouth and we expect a huge week one on the cards," Vijay Singh, CEO, Fox Star Studios said in a statement. As per the makers, the film has already created many records in its first weekend - becoming the all-time biggest February opening weekend in Bollywood and the highest non-holiday opening weekend film of Akshay Kumar . "Its lifetime collection should touch approximately over Rs 150 crore," Akshay Rathi, exhibitor said. Notably, Kumar's ‘Jolly LLB 2 ’ made a collection of over Rs 13 crore on day one at the box office. Jolly LLB 2 stars Akshay Kumar , Huma Qureshi, Saurabh Shukla and Annu Kapoor in the lead roles. "The film is doing well in metro cities in multiplexes. ' The film is riding on tremendously positive reviews and word of mouth and has taken a superb opening even on a non-holiday," said Vijay Singh, CEO Fox Star Studios.